The Wilburton Trestle is a historic wooden railway trestle in Bellevue, Washington. Measuring 102 feet (31 m) high and 975 feet (297 m) long, it is the longest wooden trestle in the Pacific Northwest. The trestle carries a single track of the BNSF Railway's Woodinville Subdivision line over a valley that used to be an extension of Lake Washington. The line runs approximately 40 miles (64 km) from Renton in the south to Snohomish in the north. Before the abandonment of the rail line by BNSF, freight trains ran six days a week, including those carrying Boeing's aircraft fuselages to its assembly plant in Renton. It was also used daily by the popular Spirit of Washington Dinner Train, but this service ceased at the end of June 2007. The trestle was originally completed in 1904 as part of the Northern Pacific Railway's Lake Washington Belt Line from Black River Junction (south of Seattle) to Woodinville. It was subsequently rebuilt four separate times, in 1913, 1924, 1934, and 1943, due to deterioration of the timber. In 1974, a road, the Lake Hills Connector, was cut through the trestle, replacing a short section with a concrete and steel structure. Wilburton Trestle saw its last regularly scheduled passenger trains in July 1922. Several Casey Jones excursion trains crossed the trestle in the 1950s and 1960s. 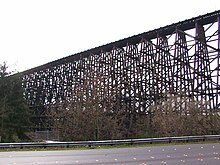 The trestle is a distinctive landmark noticed by travelers on Interstate 405 through Bellevue. While it is believed that this is the trestle pictured in the 1963 Elvis Presley movie It Happened at the World's Fair, further evidence indicates that that trestle was over the White River between Enumclaw and Buckley. Wilburton Trestle should not be confused with Wilburton Tunnel, which was a tunnel for the southbound lanes of I-405 under the railroad. The tunnel was located about a quarter mile south of the trestle prior to its demolition on August 16, 2008 for freeway improvement and widening. ^ a b c "The Wilburton Trestle; Some Little-Known Facts About This Well-Known Feature" (PDF). Eastside Business. February 2007. ^ How the Bellevue years go by, Seattle Times, March 25, 2003. Accessed online 2009-10-16. ^ Key to the City's profile of Buckley The history blurb on this page was written before the White River trestle was demolished. Wikimedia Commons has media related to Wilburton Trestle.